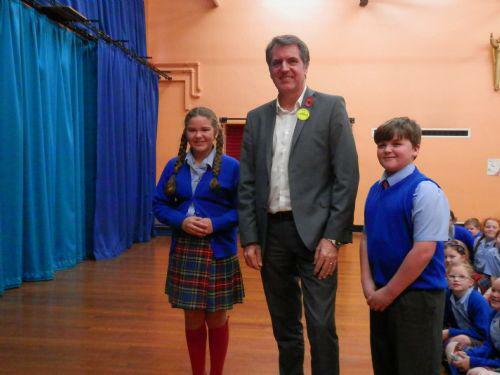 HerToday, Year 5 have been grilling...sorry interviewing, Mr Steve Rotheram the MP for Walton who is soon to be running for the first Metro Mayor of the Liverpool City Region. The children put him through his paces and showcased their research skills through intelligent questioning. He was most impressed and said at one point "That's the hardest question I've ever been asked". He told Mr. Reidel that the questions were better than the ones he gets during hustings and that we could give some Members of Pariliament a 'run for their money'. He told Y5 to aspire to the highest level possible - maybe even Prime Minister!! Why not? The first scouse PM - that should sort the country out, and it all started here!! Well done Year 5; you made us proud! We definitely have some budding MPs in the making! School Councilors Caden and Anthony take a photo opportunity with Mr. Rotherham.